Slaying zombies by the dozen will become your specialty with the Zombie Slayer Tomahawk. With so many functional features, chopping down brainless beasts will be a breeze, while authentic graphics prove what you can do with this axe. This durable blade, crafted from stainless steel, is ideal for hatcheting hordes of flesh eating monsters. Red splatters against a bright green background display your skills as a superior zombie hunter. The long handle, made with resistant rubber, increases your range of swings and style of grip so you can embed the blade as easily into wood as you can into a zombie skull. Serration and a poll spike are featured on this hawk for enhanced utility. 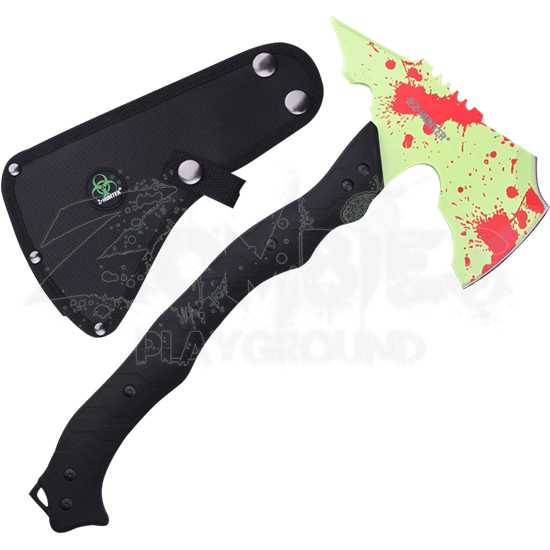 With a protective sheath included, the Zombie Slayer Tomahawk is the tool you need to keep you alive through the undead uprising.